A vinyl fence is the perfect option for any homeowner who wants an attractive, versatile, and incredibly sturdy barrier for their property. 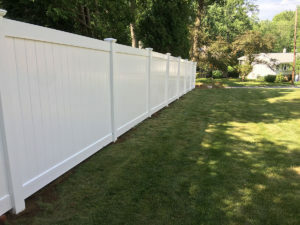 If you live in Northern New Jersey and have decided that a vinyl fence may be the right choice for your home, trust the project to the experts at Virtue Fence. We are the highest rated fencing company in the area and have a reputation for skillfully installing top-quality fencing while providing outstanding customer service. There are good reasons why vinyl has become one of the most popular fencing materials available. First and foremost, vinyl is extremely durable and flexible, so it can easily withstand years of exposure to sun, rain, ice, and strong winds. What’s more, unlike many other fencing options, vinyl does not absorb moisture, so it will never swell, rot, blister, or peel. And, with a vinyl fence, you’ll never have to worry about insect infestations causing deterioration. In addition to being exceptionally strong, vinyl requires little upkeep. In fact, maintaining its like-new appearance is as easy as occasionally spraying it down with a garden hose. Our products are also highly attractive and available in a wide range of colors and styles to suit your unique preferences. Virtue Fence is proud to offer vinyl fencing from trusted names including Illusions Vinyl Fence, Interstate Visions, and Country Estate Fence. All these premium products are backed by industry-leading warranties. Plus, our team of experts will work with you to determine what your goals are for having a fence installed at your home. Whether it’s privacy, giving your pets a space to run free, or any other reason, we’ll design the perfect option for you. And, your project will be completed by our team of highly trained and experienced installers whose work we back by a three-year warranty. For more information about the benefits of having Virtue Fence install a premium vinyl fence on your property in Northern New Jersey, contact us today.